With many of its managers nearing retirement age, ArcBest wanted its new generation of leaders to carry on its values-driven culture. Do you know which skills are needed to optimize your workforce in an ever-evolving landscape? Competencies can help. Goodwill uses Watson Talent Frameworks to define job profiles, hire and promote top talent, provide effective training and more. 844-536-3920 or schedule a consultation. Job profiles include job description, key responsibilities and a list of recommended competencies and skills with associated skill-accelerator content. Relevant competencies and skills are pre-aligned to individual job profiles in combination with job descriptions and responsibilities. Each competency or skill includes four proficiency levels and additional skill-accelerator content. 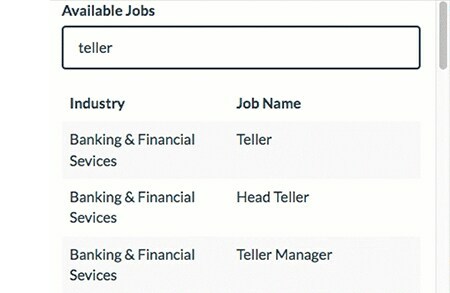 Mix and match profiles across the entire library to create a custom set of 10 individual job profiles. Job profiles are categorized into job families by function with clear identification of recommended functional and technical skills by industry or specialization. Related job families are grouped to create a focused framework of job profiles specific to an industry. The complete Talent Frameworks library provides access to over 3,000 job profiles and 2,000 competencies and skills. 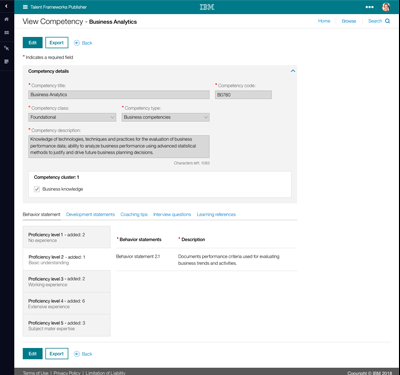 IBM Watson Talent Frameworks Publisher provides functionality for managing and modifying job profile content through a competency system of record. Additional features include job profile comparisons, alternative job titles, in-tool release notes summarizing content that is newly available and enhanced exports for sharing job and skill definitions across your existing HR applications. We provide services options for as much or as little help as you need to get started. Packages include options for training, content modification, project templates, best practices consulting and more. Contact us for additional details.